A striking view of the Wild Duck Cluster, Messier 11, taken by the Hubble Space Telescope. The venerable Hubble Space Telescope has captured a flock of "cosmic ducks" in space. The new image shows a portion of Messier 11 (M11), which is also known as the Wild Duck Cluster because the brightest stars create a "V" shape that resemble wild ducks in flight. The formation is located in a southern sky constellation called Scutum (the Shield). M11 is an open-star cluster that is a good target for amateur astronomers with a small telescope, because it is relatively easy to spot in the southern sky. For professional astronomers, it is an interesting target because the youngest stars are just 220 million years old, which is a fraction of the age of our own 4.5-billion-year-old sun, European Space Agency officials said in a statement. M11 shows us how stars evolve in their youngest stages. 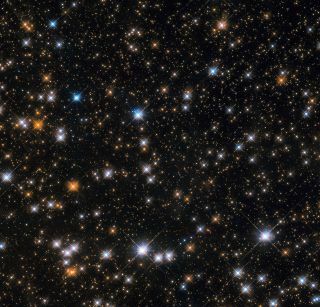 In general, open-star clusters have fewer and younger stars than globular clusters, which are mainly made up of stars that are closer in age to the universe's origins some 13.7 billion years ago. "The lifespans of open clusters are also relatively short compared to those of globular ones," officials said in the statement. "Stars in open clusters are spread farther apart and are thus not as strongly bound to each other by gravity, causing them to be more easily and quickly drawn away by stronger gravitational forces. As a result, Messier 11 is likely to disperse in a few million years as its members are ejected one by one, pulled away by other celestial objects in the vicinity." You can see a collection of Hubble's Messier imagery in a NASA gallery online. Hubble was launched in 1990, and after multiple servicing missions by astronauts, remains in good health.